Designed for everyday private living while providing a venue for family gatherings, this house replaces the owner’s childhood home that previously stood on the site. The house faces the western street while a lap pool slides along the south, leaving space for fruit trees and vegetable and rose gardens to the rear. The siting maximizes afternoon cooling of the gardens. The simple bar plan of the house is activated with cantilevered elements that protect the exterior doors and conceal an automatically retractable awning that shades the east-facing windows. 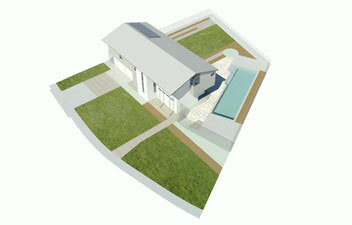 An open first floor plan flows onto the outdoor pool deck and patios. Guest bedrooms on the second floor double as studies and can be converted into one large open space. 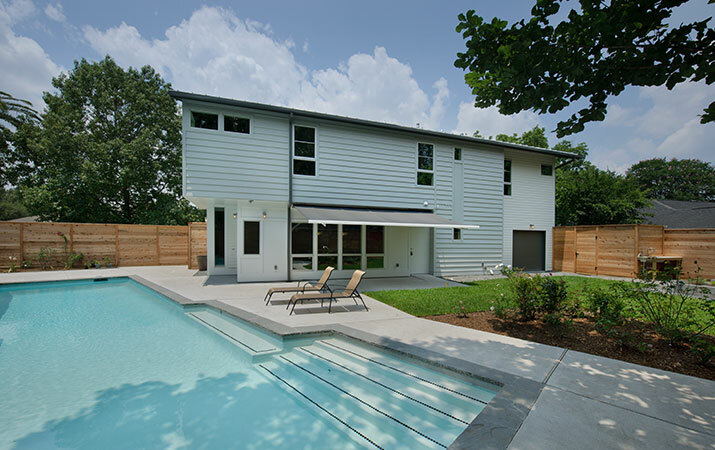 The LEED Platinum® house was the second such certified residence in Houston. Its western street elevation incorporates two heirloom stained-glass windows that minimize heat gain and glare. Sustainable design is also incorporated via whole-house water filters, cisterns, tankless water heaters, LED lamping, efficient HVAC equipment and a tight envelope. The drought tolerant turf and gravel walks minimize water usage in the gardens and the two large preserved oak trees evoke the owner’s memories of growing up on this site.